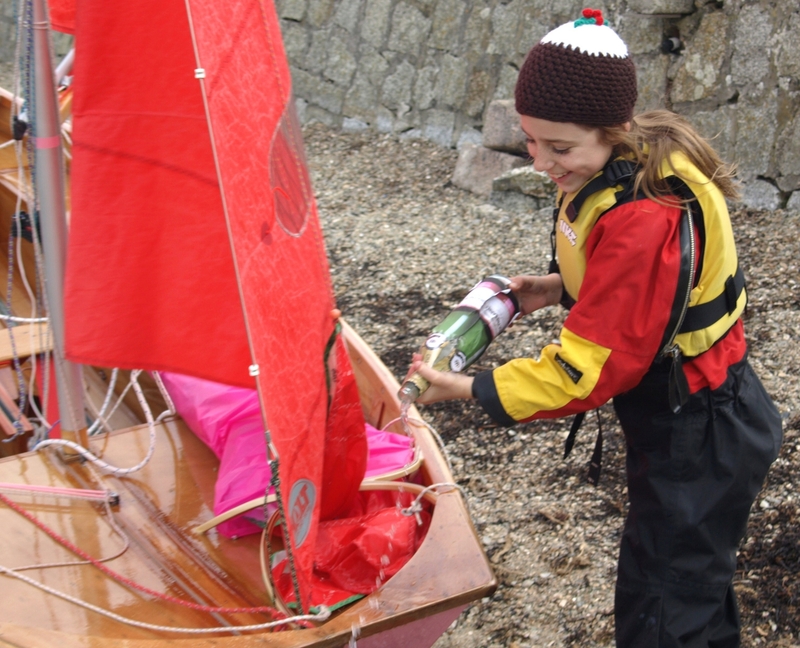 Mirror sailors have used a number of methods to stow the spinnaker when it's not in use and facilitate it's hoisting & recovery. 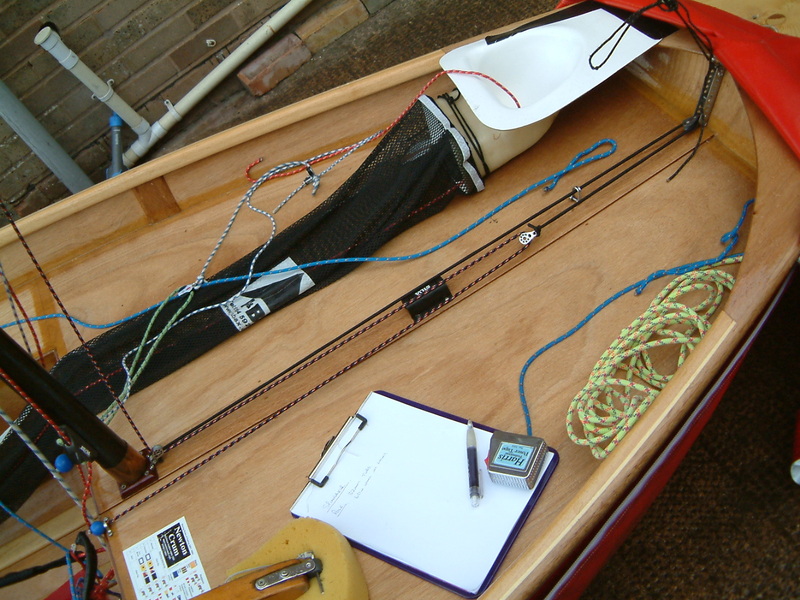 This comprises a spinnaker chute mouth and a fabric sock running back along the foredeck.. This is the most common system and almost universally used today. 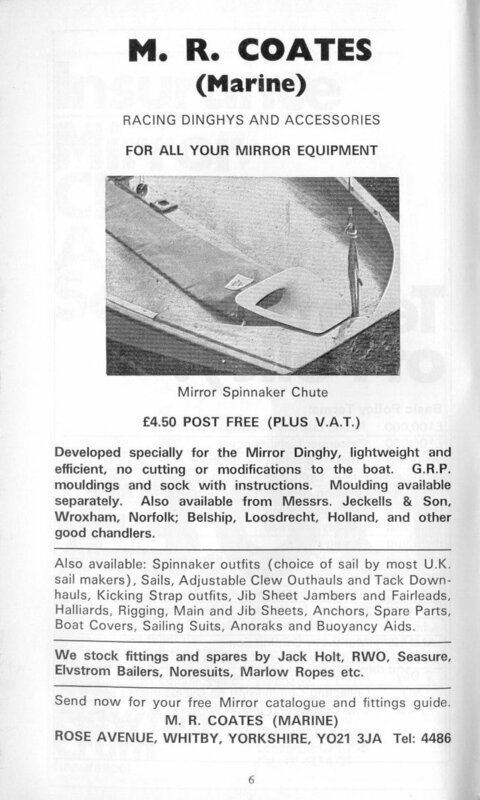 From the early days fibreglass spinnaker chute mouths designed to fit the wooden boat were common. 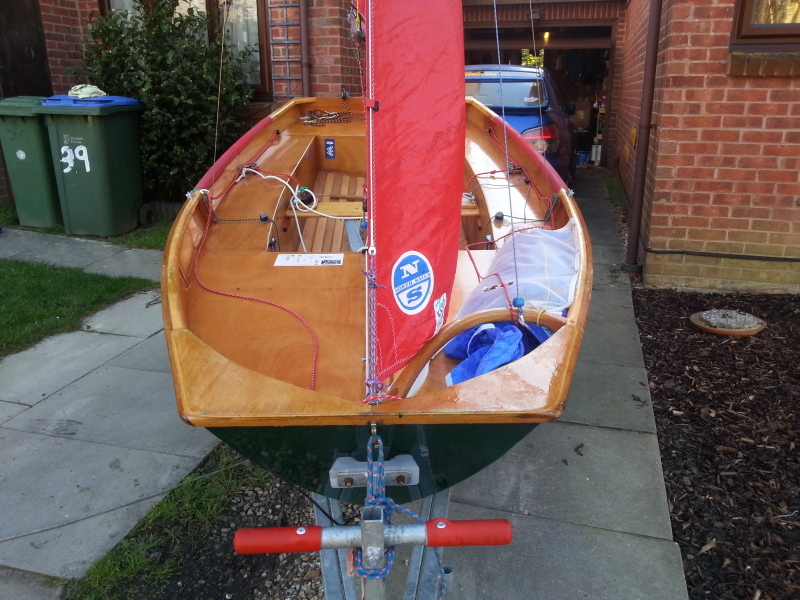 These are normally fixed to the bow shapes and the foredeck. 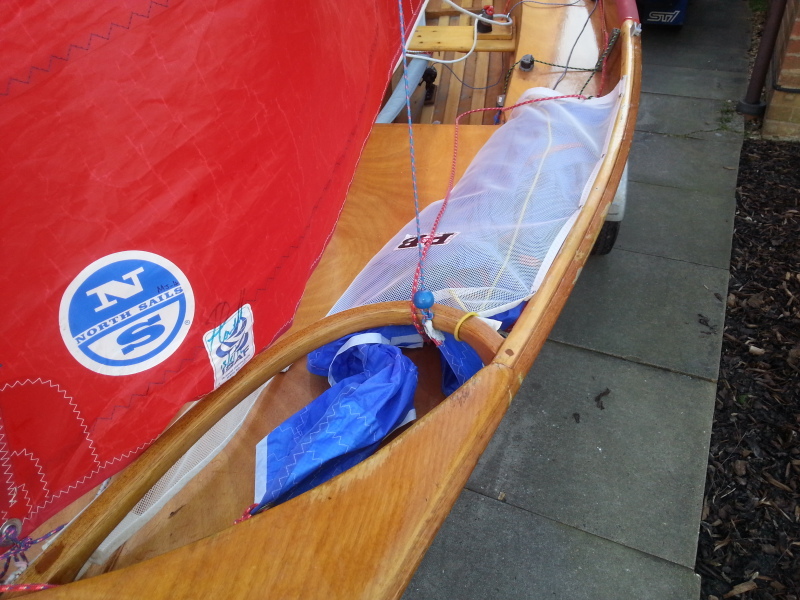 The spinnaker is equipped with a reinforced patch in the middle (equal distance for the head and the two clews). A retriver line is attached to this patch and runs through the chute mouth and inside the sock to a block or fairlead aft of the end of the sock. Pulling on the retriver line pulls the spinnaker down and into the sock. Normally, you have a longer spinnaker halyard, and the end is used as the retriver line, forming, with the part of the spinnaker between the patch and the head, an continuous loop. The chute mouth is normally fitted on the port (left) side of bow. 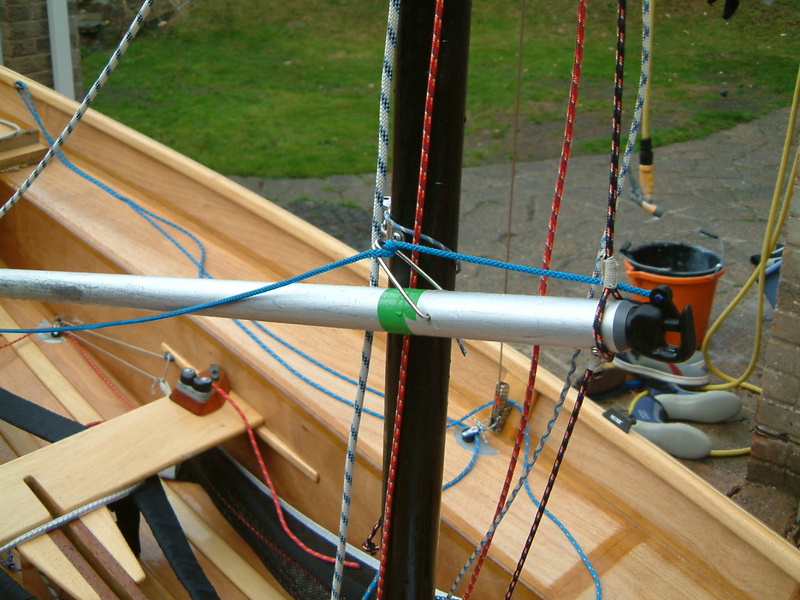 This is to ensure that first spinnaker hoist, on a normal "marks to port" course of a triangle or trapezoidal outer loop, will be with the chute mouth to leeward of the jib. This means there is no danger of the spinnaker blowing inside the jib which is often a risk when hositing the spinnaker with the chute mouth to windward. 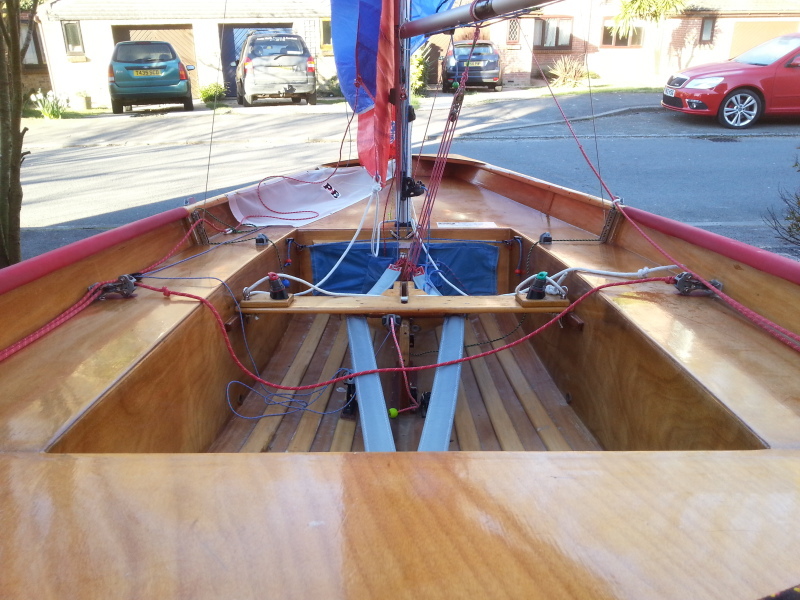 The fixing of the chute mouth to the foredeck is often problematic as the deck beams are not usually exactly in line with the fixing hole(s) at the aft end of the mouth. So unless the builder has added a mounting block in exactly the right place under the foredeck, there in nothing you can put screws into. Fixing directly into the plywood may work for a while, but tends to be weak (it's only 5mm ply) and is prone to creating leaks into the front tank that will cause a failure of the buoyancy tank pressure test. 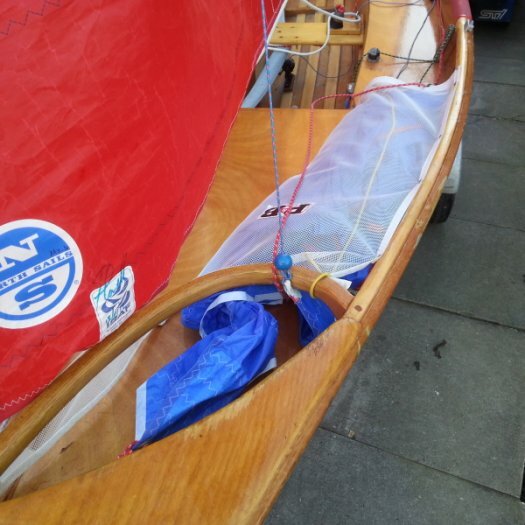 In my experience, a lot of these chute mouths have a small cross section at the aft end where the sock attaches and this means it's hard to pull the spinnaker out of, or recover it back into, them. Needless to say this is less than ideal, particularly for small, young sailors. It also puts a lot of unnecessary strain on the spinnaker, streaching it and thus reducing it racing life. This problem was so bad that Roy Partridge, 1976 World Champion, and other top sailors from that era, preferred to use a net system instead. If you want to try a fibreglass chute mouth, they are still available from chandlers such as Pinnell & Bax. Any number of ingenious alternative methods of forming the chute mouth have been used. 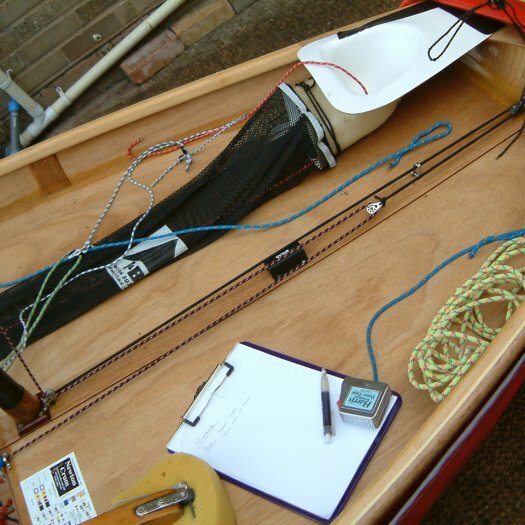 One boat featured in Guy Wilkin's book "Mirror Racing" uses a length of garden hose fixed to the gunwale and centre of the foredeck to form the chute mouth. One of Daniel Vickers' boats utilised a wooden toilet seat. More recently the wooden spinnaker hoop has been developed which is much kinder on the spinnaker and gives a much better performance. 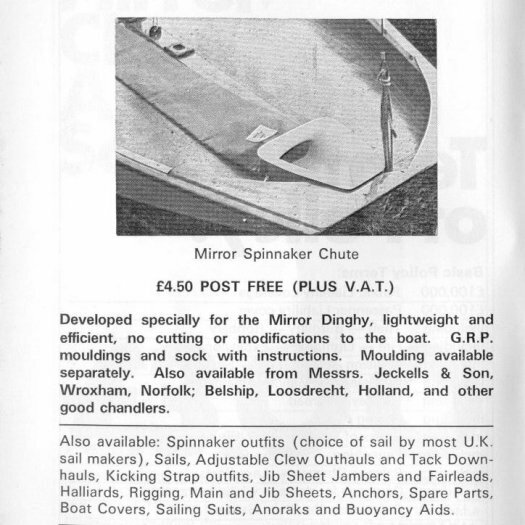 Some, such as the Duffin Mirror Spinnaker hoop (sold by P&B as part number MIR33) are available for retro-fitting. GRP boats have Manufacturer specific chute mouths which are tailored to fit that boats deck moulding. A normal chute mouth will limit how low the jib tack can be set (i.e. about level with the top of the bow shapes). If you want to set the jib tack lower, you may need a custom chute mouth like the one shown above. Originally spinnaker socks were long, reaching back to end around the aft edge of the thwart. More recently short socks, with a wide opening at the aft end and a "snuffer" have become popular. Typically a short sock ends at the aft end of the foredeck. The position of the turning block or eye for the retriver line remains the same - about level with the aft edge of the thwart, and in line with the end of the sock, so either on the side deck or inside the cockpit. The "snuffer" is a length of elastic with a plastic ring or block fixed to one end. The other end is fixed somewhere inside the chute mouth. 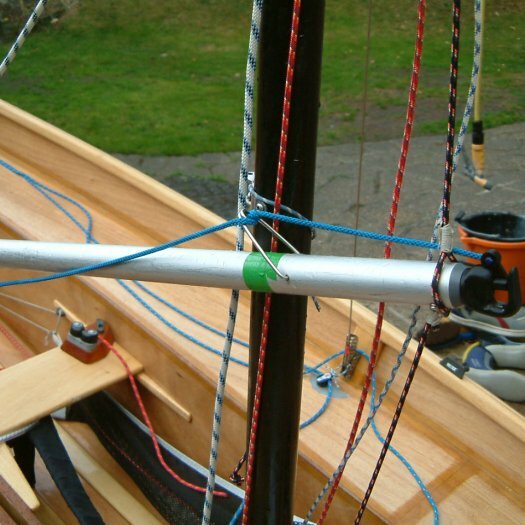 The retriver line goes from the middle of the spinnaker into the chute mouth and through the ring or block on the end of the snuffer and then though the sock back to the turning block or eye. 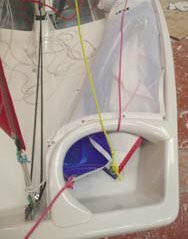 When you pull the spinnaker down, the retriver patch catches the ring and the end of the snuffer is streached aft until the spinnaker is down (head and clews in the chute mouth). When you let go of the retriver line, the elastic pulls the ring, and half the spinnaker back into the sock from the aft end. 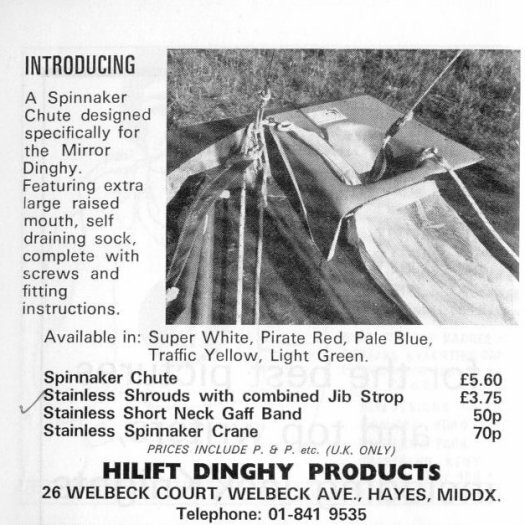 As discussed above, nets were popular in the 70s and 80s to avoid the problems of the chute mouth reducing the life of the spinnaker. 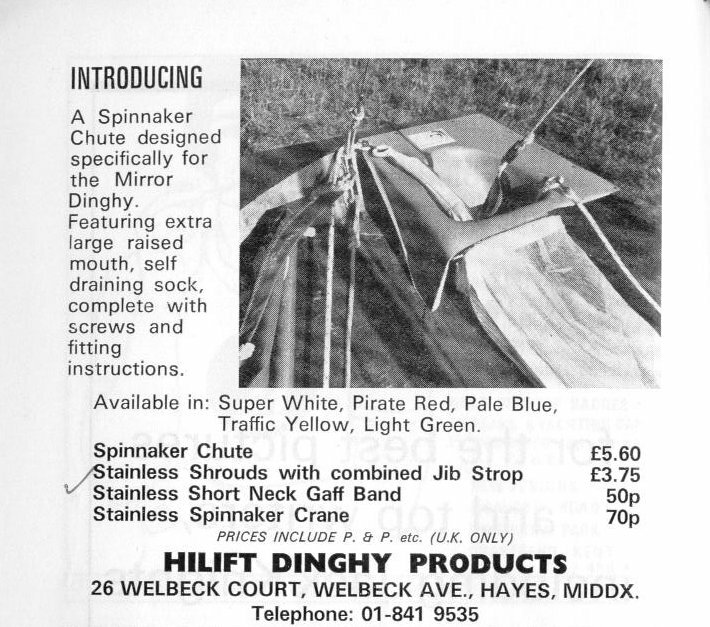 A bit like using spinnaker bags, the spinnaker is just tucked under the net to stow it. Roy Partridge favoured elastic along the front and aft edges. Others had nets with elastic running along the sides. With a net there was no retriver line. These are quite challanging to use and requiring a lot of helm and crew teamwork. 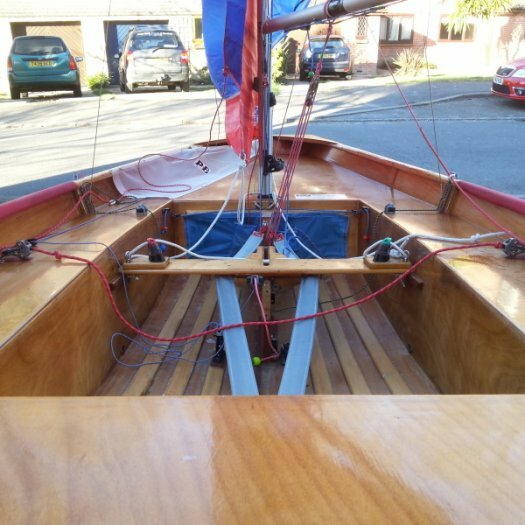 When lowered, the halyard, sheet and guy end up on the same side of the forestay. 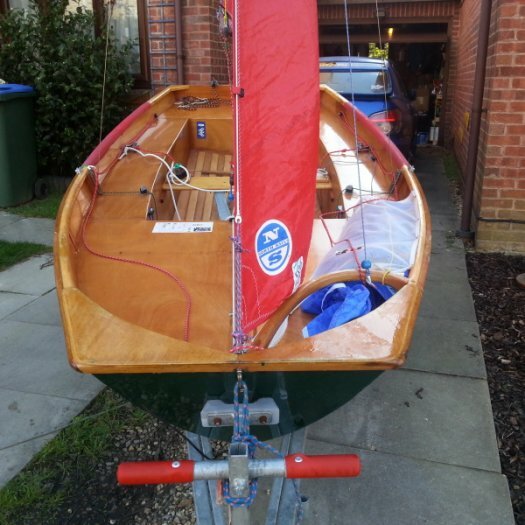 Best practice was to work out which tack the next hoist would be on, and then drop the spinnaker, or rig it in the dinghy park, so the halyard, sheet and guy would be to leeward on the next hoist. Dropping the spinnaker could be done to leeward (with the crew pulling the spinnaker in under the jib) or to windward (with the crew pulling the guy in and then the spinnker down to windward) as the helm lowers the halyard. Hoisting with the halyard, sheet and guy to leeward was always easy. Hoisting with the halyard, sheet and guy to windward means there is a risk the jib will blow back inside the jib. There was a low risk on a run or broad reach, but on a beam reach the crew either needs to pull the sheet in, to pull the spinnaker around the forestay, as it is hoisted, or throw the bundled spinnaker around the luff of the jib as the helm hoists. Used with a net, this was a lenth of alloy tube or wood (i.e. broom handle) fixed between the inner gunwales ahead of the net. Conventional spinnaker bags, either in the forward corners of the cockpit, or in the cuddies. Very rare, but ocassional considered an advantage in a venue with big seas which could sweep across the foredeck and waterlog the spinnaker in a conventional chute and sock or net. In this case it should mean less weight on the foredeck.